The SIMS CrossTabs/Sub-Group Analysis Reports in SIMS explore data relationships between response observations and a selected criteria question. The Analysis Table Report generates a SAS analysis of data for a single selected sample and each possible value of the selected criteria question. From the SAS analysis SIMS generates a Data Table comparing response observation means and p-values for panelists grouped by each criteria question response value. Special thanks to Mr. Thomas Carr who was instrumental in the development of the proper specifications for statistics that were incorporated in all CrossTabs/Sub-Group Analysis reports. Some of these statistic specifications are discussed below. 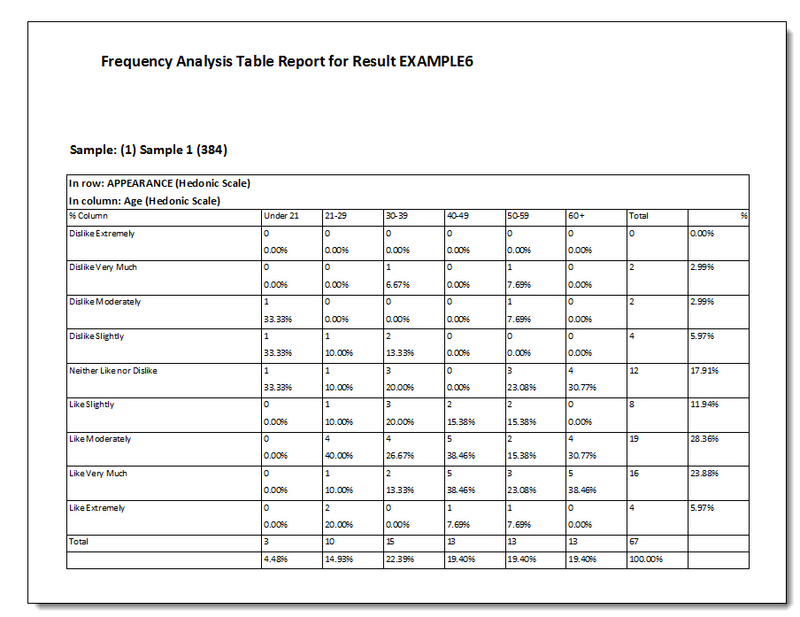 Print Screen of the Frequency Table Report "The Deck" - In Microsoft EXCEL. Print Screen of Main Report Selection Form - Attribute and Sample Selection. 1. 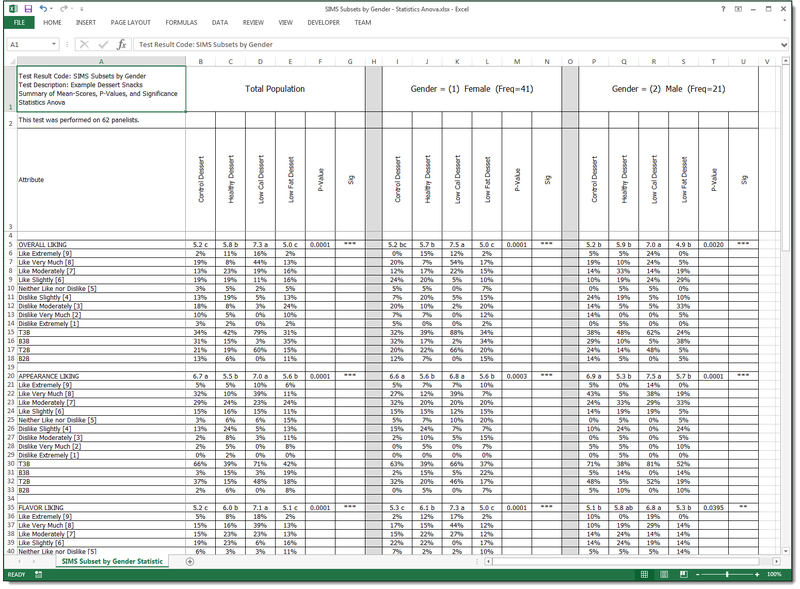 Print Screen of the Frequency Table Report "The Deck" - In Microsoft EXCEL. 4. 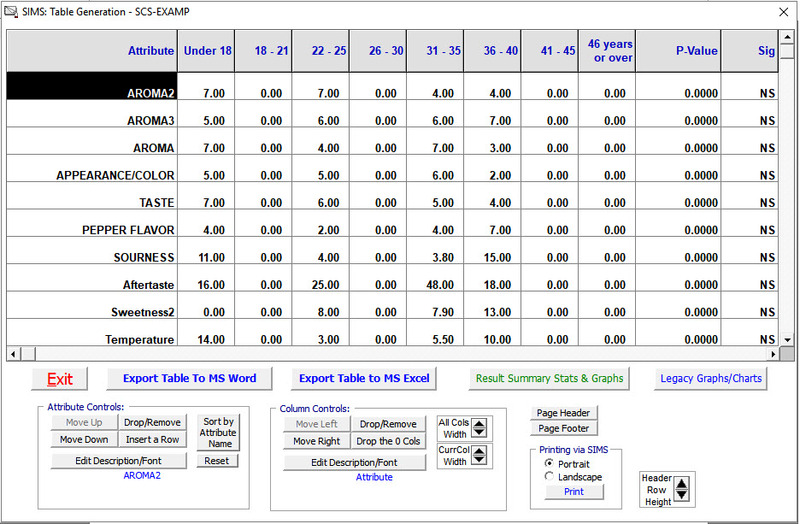 Print Screen of Main Report Selection Form - Attribute and Sample Selection. and a selected criteria question. for panelists grouped by each criteria question response value. and percentages of each attribute response grouped by each criteria question response.value. Attribute Type must be either Hedonic or Yes/No only. Only one Criteria Attribute/Question can be analyzed and presented at a time. 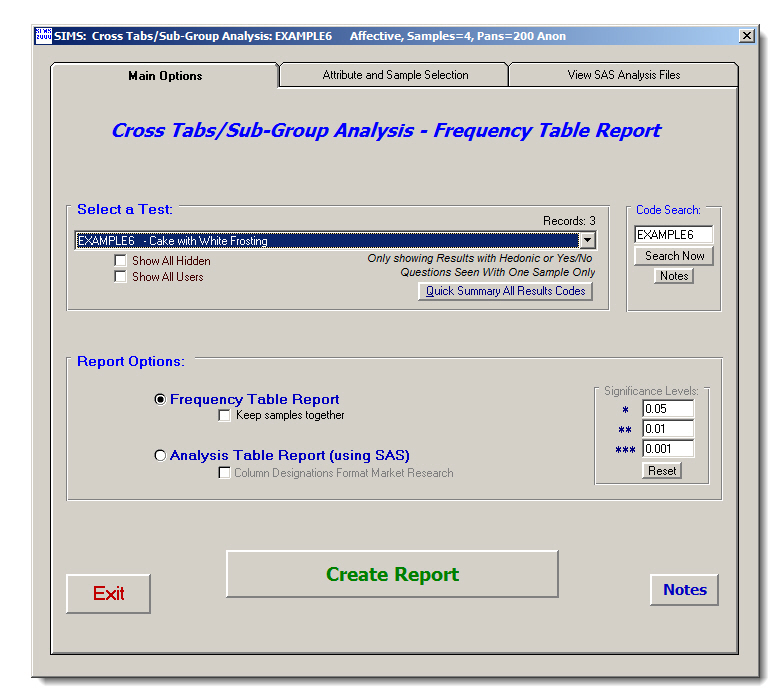 The Frequency Table Report is created only as a Microsoft Excel Workbook. Therefore, you must have Excel available on your computer when creating this report. Contents - lists the contents of each table produced by the report. Detail - displays all the tables produced by the report. This worksheet takes on the name of the SIMS result record. and questionnaire attribute. Excel will print the Contents worksheet in Portrait mode. Contents and Detail worksheets at the same time. You can select multiple questionnaire attributes for analysis at the same time. highlight all qualifying questionnaire attributes for analysis. initially selects all test samples for inclusion. # of Selected Samples (Products) X # of Selected Attributes. with the page number on the bottom. Detail pages are printed in Landscape mode. to normal attributes isolated by Sample and by Sub-Grouped Question. For example, you are testing a number of hair spray products (samples). such as Hair Thickness (Thick, Normal, or Fine) or Hair Type (Straight, Wavy, or Curly). to Product #2 according to their answers to the Hair Thickness question. 'Normal' would be in another group. display the p-value for each attribute and its significance. GROUPVAL represents the Sub-Group Criteria (e.g., Hair Thickness). 1) Hedonic or Yes/No question will always be basis for the Sub-Group Criteria Question. 2) Criteria Question type must be demographic type attribute (seen only once in the test). 3) Criteria Question type seen with ALL samples will NOT be used in basis for criteria. 4) Only one Hedonic or Yes/No question will be used to determine the sub-group. 5) One sub-group category/criteria will be analyzed and presented at a time. 6) The sub-group will be always broken out by all possible answers. (no summation or ranges) from the criteria question. 7) Same SAS Analysis procedure/table/format as existing normal export/analyze. to Microsoft Word for custom formatting and printing. where the 'AT' in file name indicates Analysis Table.